I recently remembered just how good Iggy Pop’s album The Idiot is. What I’d not realised fully was how much it was helped by David Bowie. There was a great program on BBC Radio 4 just after he died featuring many interviews with Bowie and he talked about his time in Berlin, hoping to kick his drug habit by spending time in the “smack capital of the world” (his words) with Iggy Pop. What came across well was the incredible creativity in the city at that time. Bowie made three albums there – Low, Heroes and Lodger – which became classics. I know all three well, I’ve almost worn the grooves out of them. I haven’t played The Idiot nearly as much but I did recently and it was a revelation. You can hear Bowie’s influence on every track, as well as his long-time guitarist Carlos Alomar. It’s hardly been off the turntable for the past few weeks. The picture below, one of a set I published a few weeks ago, was taken in the Lake District and processed to the soundtrack of Iggy and Bowie. It struck me while working on these shots that the feeling I want to get across from my mountain photography is the feeling I get from Bowie’s and Iggy’s Berlin work. This may now start to sound a little pompous (what do you mean, “may” ? ), comparing myself with them. I’m not in the same league. The only comparison is that I like dark moodiness, rot and decay, richness, complexity, some of the things I hear in that music. If I could make my pictures look like Dum Dum Boys sounds I’d be a happy man. I’ve updated the galleries pages. I’m particularly pleased with my Mountains set. I’ve been spending a lot of time in the Lakes and Snowdonia lately and plan to continue. I hope you enjoy them. Yesterday I went to The Photography Show at the NEC with my good friend Richard to look at the latest toys and get some inspirational ideas for our product ranges (i.e. what else we could be selling). In general, lots of good stands showing the latest and greatest stuff ranging from cameras and lenses, stills and video, 360-degree cameras, printers and papers, albums and photo-books, aluminium and acrylic bonded prints, and plenty of opportunities to spend large amounts of cash. I was keen to get my hands on one of the latest wide-angle primes from Olympus for my OMD-EM10. They kindly let me put on the very dinky and desirable little M.Zuiko 17mm f1.8. I could only get a brief impression of it “in the hand” and that impression was very good. While at the Olympus stand, they very kindly gave my camera a full clean and service for free – top marks! They couldn’t do anything about my broken battery cover though. We went to the Epson stand to look at the latest P800 printer. I’m still using an old (but great) 2100 while Richard is on the more recent R3000. Both of us would like to upgrade to bigger prints. Richard had brought some of his wonderful pictures from his recent trip to the Lofoten islands and the Epson man kindly loaded them up and made a couple of A2 prints of them. Much more quickly than I expected (about four to five minutes for an A2 sheet) the prints were ready and looking wonderful. Richard had been interested to see how his Sigma Merrill shots would stand up to that level of enlargement. The answer was wonderfully well. Richard later got his wallet out and ordered the P800. I hope he’ll let me make a couple of prints to see how my EM10’s 16 megapixels stretch to that size. It was good to meet an old colleague of mine from many years ago, Tim Parkin of On Landscape magazine. I’d like to say that I worked with Tim before he was famous 🙂 He’s done incredibly well in the imaging world since then. Richard and I both really liked the range of aluminium, acrylic and glass bonded borderless prints available. We both think they’d be really saleable but the prices are currently about twice what we’d need them to be to make them saleable for us. Richard is an enthusiastic Sigma user and we wanted to see the brand new SD Quattro. It was a little bigger than we’d expected but felt just perfect in the hand. It didn’t have either battery or lens so weight was difficult to judge but fairly light, I think. Obviously a whacking great zoom lens might change that a little. The controls fell to hand really nicely but I was only guessing as to their assumed function as I couldn’t turn it on to check. The killer for me though would be lack of Lightroom support. This was my first time at the show but I think I’ll definitely be back next year. I was really impressed by how friendly all the stand staff were, such as the Blackmagic Design guys who let us play with their 27″ 5K imac even though we weren’t actually interested in the Blackmagic products and the Epson guy who made the prints for Richard. The Olympus OMD-EM10 (mark 1) has a built-in monochrome preset called “monotone”. If you select this preset (menu -> Shooting Menu 1 -> Picture Mode -> monotone ) then you get a monochrome view in the rear screen and the EVF. This is really nice, you can visualise exactly what you’ll get in black and white. This is true both for raw and JPEG. So I’ve tried various simple conversions in Lightroom to see how they compare to the camera’s version. WARNING – the differences between the different versions are quite subtle. You may not see any difference (or a spurious difference) unless you’re using a well set-up monitor. If you’re really interested, email me and I’ll send you full size versions. The next version is the raw file imported into Lightroom and then desaturated (Saturation slider set to -100). No other adjustments. It’s close to the in-camera version but slightly lacking in contrast. This time it has slightly more contrast than the in-camera conversion but that’s not all. It has a slightly different look to it. I conclude that the Olympus conversion uses a very mild contrast curve but with some extra “look” to it that I can figure out myself. Possibly it’s some difference in the mixing of the colours. Next version is the raw file converted to monochrome using Lightroom’s “B&W” panel in the Develop module. From the “HSL / Color / B&W” panel I clicked B&W and didn’t do any further adjustments to the colour channels, nor did I do any other adjustments. Next, I converted from raw in Lightroom using one of Lightroom’s B+W presets – “B+W Look 4”. This is my favourite Lightroom B+W look, low contrast, dark and gritty with significant vignetting. This is obviously quite different from the Olympus version. I much prefer the detail in the Lightroom version but I don’t know how this will show on a large print. In normal on-screen viewing I don’t think it is noticeable. Shoot in JPEG and accept what comes out of the camera with no adjustments. I think for the kind of B+W work I do it might be quite healthy to use the first option. £7 for car parking??? I really need to get better at finding free parking in the Lake District. My plan was for Grasmere and I realised there aren’t any cheap car parks around Grasmere. It turned out to be worth it as the light and weather were fantastic. I’d thought of staying low down by the water but I couldn’t help following the rough path up to Loughrigg Fell. There’s a proper panorama up there taking in Grasmere, the Fairfield horseshoe, Great and Little Langdales, Bowfell and the Pikes, Wetherlam and Coniston Old Man, Windermere, and more besides. I had to reject a few pictures when I got home because of motion blur – even with the camera on the tripod and me putting all my weight on it the wind was strong enough to shake the shot to fuzziness. All taken with the Olympus OMD-EM10 and M.Zuiko 14-42mm pancake zoom. It’s even fairly tough. I dropped my camera and it hit the ground lens-first. It now sports a small dint on the front (not on the glass) but still works perfectly. For it’s size and weight it’s fantastic. The exception is for many monochrome conversions (though not this one). I often use Lightroom’s “B+W Look 4” preset and when I do I don’t usually change anything. This particular shot was converted manually though. 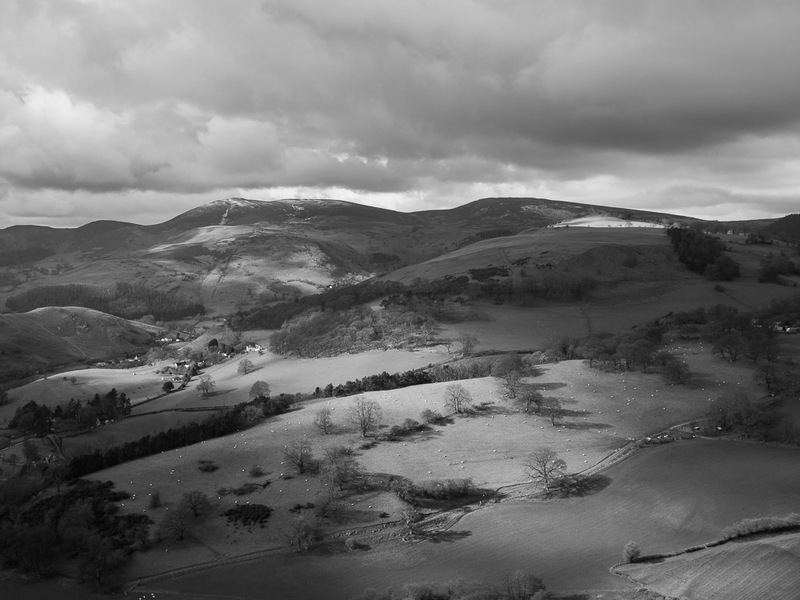 A walk round the hills above Llangollen yesterday. Changeable weather is good photo weather but I’d forgotten my waterproofs! A good day for monochrome, apart from the single shot in colour. The oranges in that shot were too good to lose. All taken with the Olympus OMD-EM10 and 14-42 pancake lens. The sharpness from this cheap kit lens continues to amaze me. Another reason it’s taken over from the Pentax as my general workhorse.